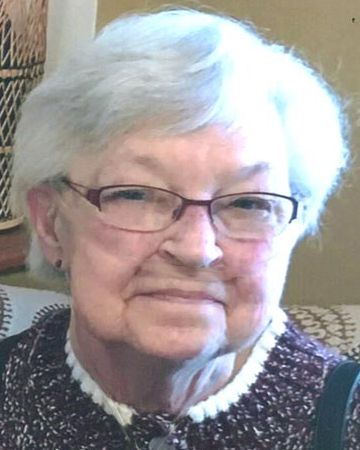 Cobleskill- Jean B. Collins, 77, of Cobleskill, died peacefully on Monday, January 28, 2019 surrounded by her loving family at her daughter’s home. Born August 18, 1941, in the town of Fulton, Schoharie County, she was the daughter of the late Leo and Audrey (Killmeier) Bouck. Jean was a graduate of Middleburgh Central School and married William “Bill” Collins on Aug. 22, 1959. Jean was employed for thirteen years at SUNY Cobleskill, working in the food industry and from 1988 until 1994 she worked at JSP Slip Forming. She came out of retirement in 1998 to work as secretary for her husband’s and son’s family business, Collins Concrete. Jean enjoyed golfing, crocheting, reading and traveling. Time spent with her grandchildren was most precious to her. She was predeceased by Bill on February 8, 2014. Left to cherish Jean’s memories are her children: April (Randy) Johnson of Fort Plain, Tina (Rick) O’Dell of Johnstown, Beth (Brian) Whitman of Fort Plain, Raymond (Denise O’Neil) Collins of Gardiner and Michael (Carrie) Collins of Cobleskill; her siblings: Leo Bouck, Jr. of Gloversville, Patricia Brown of Warnerville, and Carol Bouck of Altamont; seventeen grandchildren, and nineteen great-grandchildren. Family and friends are invited to a period of visitation to be held from 5PM to 7PM on Thursday, January 31, 2019 at Mereness-Putnam Funeral Home, 171 Elm St., Cobleskill. A graveside service will be held in the Spring at Lawyersville Cemetery. There's still time to send flowers to the Graveside Service at the Lawyersville Cemetery at 11:00 AM on April 25, 2019.